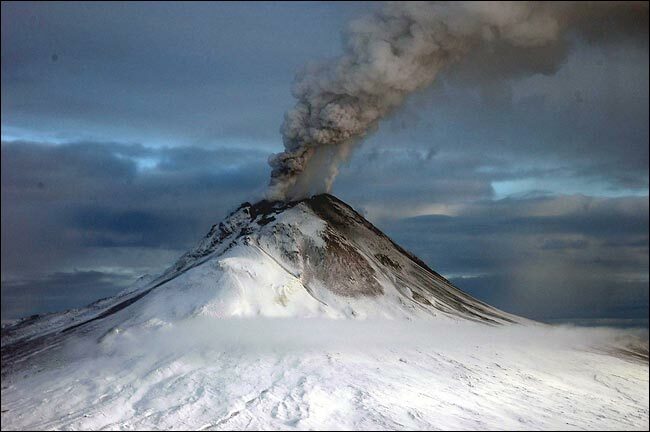 Augustine Volcano in Alaska has been erupting ash and steam for two days. ANCHORAGE, Alaska (AP) -- A volcano on an uninhabited island 180 miles from Anchorage erupted three times Friday, sending plumes of ash more than six miles into the sky. Airplanes were warned to keep at least five miles away from 4,134-foot Augustine Volcano. The National Weather Service warned about 16,000 residents of Kenai Peninsula and Kodiak Island to the south -- an area that includes the city of Kodiak -- about the ash cloud. But the Alaska Volcano Observatory said it did not expect a heavy accumulation of ash. Some schools on the Kenai Peninsula closed, affecting about 2,500 students. Anchorage was in no danger. Ash can pose a health risk -- especially for people with respiratory problems -- and can damage the engines of vehicles on the ground and aircraft that fly through the plumes. The eruptions occurred around 4 a.m., 9 a.m. and 11:30 a.m. Alaska time, and followed two bursts from the volcano on Wednesday. Those earlier eruptions were the volcano's first in 20 years. Similar short-lived explosive activity is expected to continue over the next several days or weeks, observatory spokeswoman Jennifer Adleman said, and additional eruptions could occur with little or no warning.